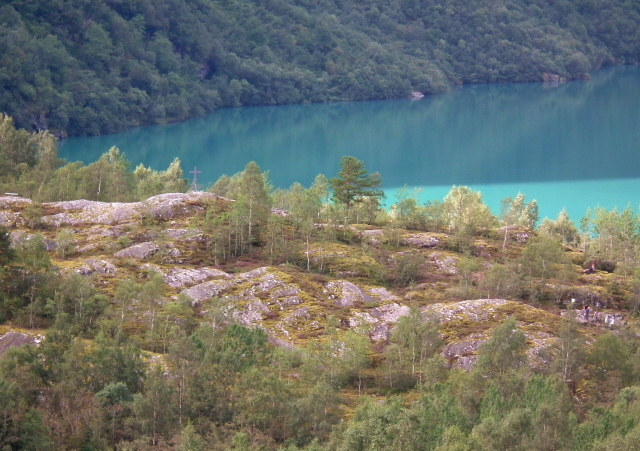 The site of two massive landslides that caused tsunamis that swept away villages on the shores of Lovatnet lake killing several dozens of villagers on both occasions. It was one of the worst natural disasters in the modern history of Norway. The place where the rocks that fell from the mountainside have created "new land" on the lake is a kind of pilgrimage site today. You can also see wrecks of boats swept away and crushed by the waves. A tragic place set in impossibly beautiful scenery on the edge of the great Jostedalsbreen glacier ... such a Norwegian juxtaposition. More background info: Scenic as the steep-sided valleys and fjords of Norway may be, sometimes they also pose terrible risks to the people living in them. Mt Ramnefjell in Lodalen is an especially deadly example. Twice in the 20th century it caused major tragedies when huge landslides from its steep slope crashed into Lovatnet lake below triggering tidal waves that swept away entire villages on the lake's shores. The first of these occurred in 1905, on 15 January, when a huge, ca. 350,000 cubic metres chunk of the mountainside plummeted into the lake below and caused a surging wave at the bottom, which on hitting the shoreline built up into a massive tsunami. The nearby villages of Bødal and Nesdal were all but obliterated and 63 people perished. Only 9 of the bodies were ever found. The survivors rebuilt their villages, on somewhat higher ground and in the belief that such a tragedy couldn't possibly happen again. On 13 September 1936, however, it did, this time even worse. Something like a million cubic metres of rock came down from the same side of Mt Ramnefjell again, once again causing a massive tidal wave, and destroying the same villages all over again. This time around the death toll was 72 (some sources say even more). The steamboat "Lodalen", which had been used for carrying passengers along Lovatn, was swept inland some 300 to 400 m in the 1905 tsunami and was just left lying there. Then in the second tsunami of 1936 it was picked up by the wave again, carried even further inland, and this time, pummelled by the force of the water, it was completely destroyed. Its wreck can still be seen today by the pilgrimage path on the headland opposite Mt Ramnefjell. What there is to see: not all that much. As you drive the lakeside road south along the eastern shores of the beautifully green glacial lake Lovatnet (also known as Lovatn), you pass today's tiny village of Bødal and on your right there suddenly appears a small memorial site, consisting of a plaque with the names of the victims of the two disasters of 1905 and 1936 as well as some information panels that explain the local geology and what happened here. Just beyond the small car park by the memorial stone and panels, a path starts that goes down all the way on the headland and towards the new land created by the landslides. It's a pilgrimage hike in more than one sense. A) it's called that, "Pilgrim's Path", and B) along its course you'll see little panels with biblical quotes. (Meant to be uplifting, no doubt … but as so often it doesn't work with me. One was referring directly to the mountain being a source of danger, but, not to worry, "our Father in Heaven will protect us" … huh? No he evidently does not! I've never understood what consolation there is supposed to be in having a god that first creates such disasters, then does nothing in the way of protecting and instead just looks on … but what do I know, I'm only an atheist). It's not a long hike, but it does get quite steep and slippery in places, so you need to tread carefully. About one third of the way down you pass an oblong mangled piece of rusty metal – this is the wreck of the "Lodalen" steamer that once ploughed the waters of the lake and was swept away in the first tsunami and then completely wrecked in the second disaster three decades later. Hike on and eventually you'll come out by the Lovatnet Cross – this is today's main memorial site. Right next to today's cross you can spot some bent, rusty metal spikes poking out of the rocky ground. This is all what remains of the memorial to the first of the Lovatnet disasters. It was itself mostly destroyed by the second disaster. Completely coincidentally, when I was there in August 2012 a memorial service was being held by the cross. So I stayed on to witness this. It was all in Norwegian, of course, so I was glad that I had a good excuse for not being able to join in in the singing of hymns and all the praying. But it was a strangely touching experience all the same witnessing this ceremony at the very site. Why it was held on this day, however, I do not know – it wasn't the anniversary day of either of the disasters. Maybe some other tradition I am unaware of was at play. Other than the Lovatnet Cross, the "Lodalen" wreck and the memorial plaque and information panel by the road there isn't much to see here. But looking across the promontory in the lake towards Mt Ramnefjell where you can see the huge scar in the rock face you get a vague idea of the powers of nature that had been at work here. Most people come here en route to the scenic glacial tongues of Jostedalsbreen, in this case Kjenndalsbreen in particular. And it is indeed worth continuing down the road to see this too – see below. Location: inland from the Western Fjords area of southern Norway, north of the massive Jostedalsbreen glacier, towards the southern end of Lovatnet lake, about 7 or 8 miles (12 km) south-east of the small town Loen, which itself is near Stryn at the head of the Innvikfjorden arm of the great Nordfjord. Access and costs: easy by car, less so on foot, but possible as a hike from Loen. Free. Details: Unless you're staying in Loen and are up for a really long hike from there, you will need your own transportation, i.e. preferably a car. Then the first bit is easy. Take the road inland from the large car park by the tourist information in Loen that goes past the Hotel Alexandra. A couple of miles down this road you get to the north-western end of Lovatnet lake from where the road more or less follows its northern shoreline – which is an incredibly scenic drive. Shortly after you've passed the village of Bødal, where the road dips inland a bit, you'll suddenly come to the small car park by the memorial and information panel. There's only space for three or four cars, so when it's full you'd have to carry on. There's another spot to park a bit further downhill. The beginning of the Pilgrim's Path is just a little further down the road from the memorial stone/info panels towards the toll road to Kjenndalsbreen, branching off to the right. The hike is well enough signposted. Sturdy hiking boots are advisable as the path gets quite slippery and steep in places. For those wanting to stay overnight in the area there's camping facilities in the vicinity, and the nearby towns of Loen and Olden have a number of good hotels, some with nice views over the fjords. A bit further away but superbly located scenery-wise, is a place called Briksdalsbre Fjellstove (mountain lodge) at the end of the road from Olden to Briksdalsbreen. The latter is an incredibly popular place which in season is terribly overrun by tourists much of the time during the day – but if you stay here you have to option of hiking to Briksdalsbreen glacier in the evening when the hordes have left, or in the morning before the first coach parties arrive (from ca. 8 a.m.). Time required: Just taking a look at the memorial and information panel and across the lake towards the scarred mountainside won't take more than five to ten minutes. If you decide to hike down the Pilgrim's Path all the way to the Lovatnet Cross then you should add another 30 to 40 minutes for this. When I was there the memorial service at the cross took an extra half an hour or so, but of course it was an exceptional coincidence to be there at precisely that time (that year it was in the afternoon of Sunday, 19 August). Combinations with other dark destinations: A site related to Lovatn is Tafjord further north, where a similar landslide and tsunami disaster occurred in 1934. It's only 35 miles (55 km) from Lovatnet as the crow flies, but a very roundabout drive at least three times that distance and requiring a ferry crossing en route, so it may be rather tricky to combine Tafjord and Lovatn in a single day. Better plan in an overnight stay at one end or both. Just across on the other, southern side of the mighty Jostedalsbreen glacier system is Fjaerland, a ca. 70 miles (100 km) drive away (1½ to 2 hours). Here you can find the Fjaerland Glacier Museum with its somewhat frightening section about climate change. For more places further afield see under Norway in general. Combinations with non-dark destinations: Lovatnet itself is a marvellously beautiful body of water, thanks in particular to its mysteriously deep green colour. The not at all mysterious scientific explanation is that the water is meltwater from the surrounding glaciers and thus contains a high level of dissolved minerals. If you carry on further down Lovatnet from the memorial stone/info panel site by the road, you get to a privately maintained toll road (honesty box system – you just throw the fee into a box by the gate … and don't you even think about not doing that!). This takes you to a place near the Kjenndalsbreen glacier tongue. Of the better-known such glacier tongues of Jostedalsbreen, this is one of the lesser visited ones. Indeed, compared to Briksdalsbreen, which is swamped with tour groups much of the time, Kjenndalsbreen is a truly serene place. When I was there, hardly anybody else was about. For a short time we even had the place all to ourselves. Maybe it was for that reason that I couldn't resist the temptation of clambering all the way to the edge of the huge blocks of ice at the end of the glacier. Actually one shouldn't do that … I hasten to add. Indeed there are signs warning of possible rockfalls, sudden water surges and such like. So it was a bit foolhardy … but I have to admit it was an exhilarating feeling making it there and hacking a piece of ice off as a kind of perishable souvenir … My wife just grudgingly accepted my idiocy, but without approving of it. Since I didn't drown or get crushed by ice or rocks it was OK in the end. Jostedalsbreen also has properly guided adventure options, including walks on the ice with crampons and such genuine mountaineering stuff. Ask at the tourist info in Loen for details if this is your thing. At the other end of the scale of adventure is the commodification of Briksdalsbreen – where little electric vehicles called Troll Cars cart the less mobile (or lazy) tourist hordes to the glacier viewpoint … otherwise it's a ca. 45 minutes hike – and you need waterproof clothes as you'll pass a roaring waterfall that thoroughly sprays the path with more water than normal clothing could easily absorb. For photos of these glacial tongues, and also more on the subject of glaciers in general, see under Fjaerland Glacier Museum! Other than glaciers, the region also sports one of Norway's premier natural sights, possibly the most iconic fjord of them all: Geirangerfjord. This isn't far from Lovatn either (a good 60 miles/100 km to the north-east). In fact you can use the scenic ferry ride from Valldal to Geiranger to cover part of the distance when driving down to Loen and Lovatnet from more northern parts of Norway. That way you best get to see what is indeed a stunning scenery to behold – it really is impressive to experience for real, no matter how often you've seen pictures of it on postcards, tourist brochures and guidebooks.